Gender and Social Hierarchies offers a fresh and coherent picture of applied research from within social psychology on the intricate relationship between gender and social status. It comprises a collection of innovative approaches which seek to understand the pervasiveness of status asymmetry between gender categories. Drawing upon recent theoretical advances in gender psychology, the book provides tools for developing practical and political recommendations to address and resolve status inequality today. Each chapter examines a different aspect of the impact that gender-based social hierarchies have on people’s lives. Part One explores the consequences of gender stereotypes in school, higher education, and in professional settings. The struggles faced by women in the workplace are discussed in Part Two, featuring topics such as work-life balance, the ‘glass cliff’, and the lack of support for affirmative action. Part Three is devoted to the antecedents and consequences of gender-based forms of prejudice, such as discrimination against gay men, and against women within cultural minorities. The book concludes with some practical suggestions for working towards lasting and beneficial change. 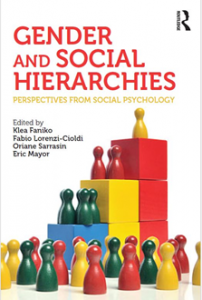 Gender and Social Hierarchies will appeal to scholars and students across the social sciences and offers important insights to practitioners and policy-makers.